The combination of ingredients in this dish might make you think of fall or winter, but don't wait for a holiday dinner to enjoy these delicious roasted vegetables. 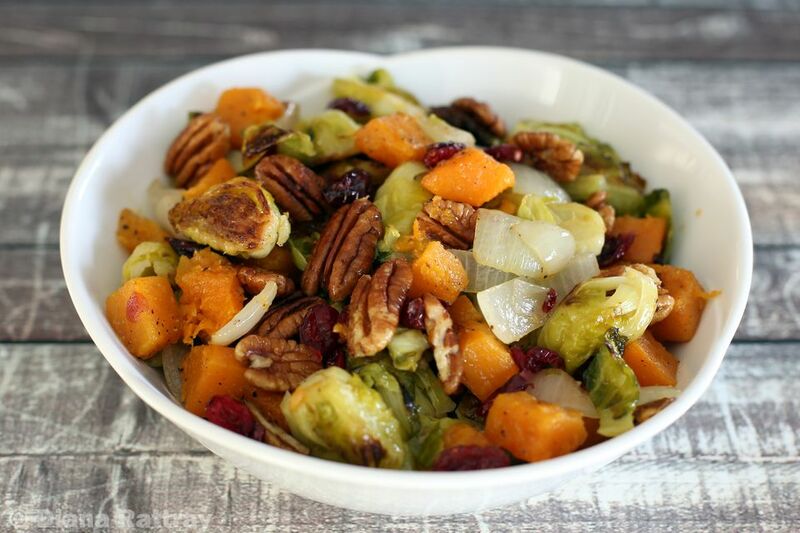 The combination of butternut squash, Brussels sprouts, cranberries, and pecans is a delicious dish that will add a special touch to any meal. You can change things up a bit by using raisins instead of the cranberries, and toasted walnuts or almonds would be great in place of pecans. Heat the oven to 425 F (220 C). Oil a large rimmed baking sheet (half-sheet pan) or two smaller jelly roll pans. Alternatively, line the baking sheet with nonstick foil and oil it lightly. Peel the butternut squash and, using a spoon, scoop out the seeds and fibers. Cut the squash into 1/2-inch cubes. Put about 4 cups of cubes into a large bowl (saving the rest for another dish). Trim the stem ends off of the brussels sprouts and removed loose, damaged, and yellow leaves. Cut the sprouts in half lengthwise. Add them to the bowl with the squash cubes. Peel the onion and cut it into 1-inch chunks or thick slices. Add to the bowl with the squash and Brussels sprouts. Drizzle the olive oil over the vegetables and gently toss or stir to coat them thoroughly. Arrange the vegetables on the baking sheet and then sprinkle lightly with kosher salt, pepper, and garlic powder, if using. Bake in the preheated oven for about 10 minutes and then turn the vegetables. Continue baking for 10 to 15 minutes longer, or until the vegetables are browned around the edges and are tender. Meanwhile, toast the pecan halves: Heat a large dry skillet over medium heat. Add the pecans and cook, stirring, until the pecans begin to brown and smell aromatic. Transfer the roasted vegetables to a large bowl. Add the dried cranberries and pecan halves and toss gently to combine all ingredients thoroughly. The amount of oil can be reduced a bit, but ensure that all of the vegetables are well-coated with it. Use a large enough baking sheet for the veggies, or use two baking sheets. The vegetables should be roasted in a single layer, ideally with a bit of space showing between the pieces. Replace the butternut squash with the same amount of cubed acorn, Hubbard, or buttercup squash. Feel free to omit the onion. Replace about 1 cup of the butternut squash with parsnips sliced into strips about 1/2 inch by 2 inches. When the roasted vegetables come out of the oven, drizzle them with 1 to 2 tablespoons of maple syrup; add the pecans and cranberries and toss gently to combine.